Bring an air of calm serenity to your bedroom with the Zoelle bedding collection by Croscill. The spa blue background and intricate ivory embroidery will evokes a sense of peace throughout the room. Beautiful pillow shams with flanged edges, and European shams done in an ivory quilted pattern further show an almost spa-like quality of this collection. A simple bedskirt keeps the main focus on the comforter and pillows. Long drapery panels carry over the calming blue and ivory embroidery. Use the contrasting floral fashion pillow and the beaded boudoir pillow to finish the look. Croscill has been a manufacturer of high quality bedding at affordable prices for more than 50 years! 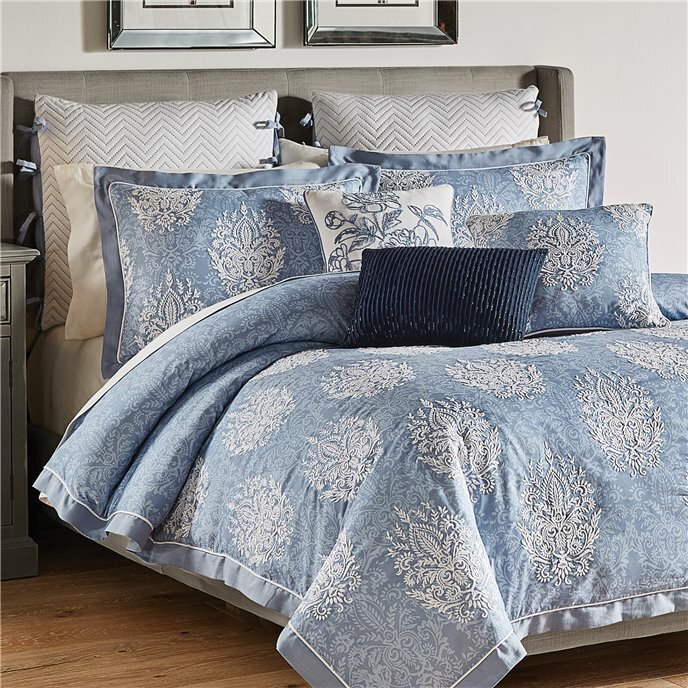 The Zoelle Bedding Collection brings a relaxing mood into your bedroom with its beautiful blue print fabric and embroidered medallion detailing. The comforter and pillow shams are further accentuated with a solid blue flange and covered cord trim. PLEASE NOTE: Embroidery detail on comforter does not continue to the top. One (1) Queen Comforter, Two (2) Standard Shams, Comforter measures 92x96, 100% Cotton and poly fiber fill, dry clean recommended, imported. Manufactured by Croscill. The Zoelle Bedding Collection brings a relaxing mood into your bedroom with its beautiful blue print fabric and embroidered medallion detailing. The comforter and pillow shams are further accentuated with a solid blue flange and covered cord trim. PLEASE NOTE: Embroidery detail on comforter does not continue to the top. One (1) King Comforter, Two (2) King Shams, Comforter measures 110x96, 100% Cotton and poly fiber fill, dry clean recommended, imported. Manufactured by Croscill. The Zoelle European Sham features an ivory colored quilted fabric with blue stitching presented in a chevron pattern. This sham reverses to an ivory solid fabric and is trimmed with beautiful bows down each side. One (1) European Sham, Measures 26x26, 100% Cotton, dry clean recommended, imported. Manufactured by Croscill. The Zoelle 19” x 11” Boudoir Pillow features a stunning dark blue voile fabric presented in a pleated design with intricate beading throughout. This pillow reverses to the dark blue voile fabric. One (1) Boudoir Pillow, Measures 19x11, polyester fabric and poly fiber fill, spot clean recommended, imported. Manufactured by Croscill. The Zoelle 16” x 16” Fashion Pillow features a beautifully designed floral embroidery detailing on a solid ivory fabric. This pillow reverses to the solid ivory fabric and is trimmed with a solid blue covered cord. One (1) Fashion Pillow, Measures 16x16, 100% Cotton and poly fiber fill, spot clean recommended, imported. Manufactured by Croscill. The Zoelle 18” x 18” Basic Square Pillow features the beautiful blue print fabric with embroidered medallion detailing. This pillow reverses to a solid blue and is trimmed with a lovely covered cord. One (1) Square Pillow, Measures 18x18, 100% Cotton and poly fiber fill, spot clean recommended, imported. Manufactured by Croscill. The Zoelle Back Tab Window Panels feature a beautiful blue print fabric with embroidered medallion detailing. Each panel is lined with a solid white polyester lining and include encased weights in the bottom hem. Two (2) Backtab Panels, Two (2) Tiebacks, Measures 82x84, 100% Cotton, dry clean recommended, imported. Manufactured by Croscill. The Zoelle Back Tab Window Panels feature a beautiful blue print fabric with embroidered medallion detailing. Each panel is lined with a solid white polyester lining and include encased weights in the bottom hem. Two (2) Backtab Panels, Two (2) Tiebacks, Measures 82x95, 100% Cotton, dry clean recommended, imported. Manufactured by Croscill.